There is a bag of chocolate chips in my pantry in severe danger of being exterminated. Or… I might break down and make a family favorite. Cinnamon Toasties. Now, they’re not 100% chocolate (I know, shocking isn’t it?) but they are just so darned good it’s hard to eat just one. And they have chocolate chips IN them. In the world of “almost chocolate,” these little items are hard to beat. And they’re ridiculously easy and quick to make. Always a bonus. Once upon a time this recipe had no chocolate chips. It had raisins. 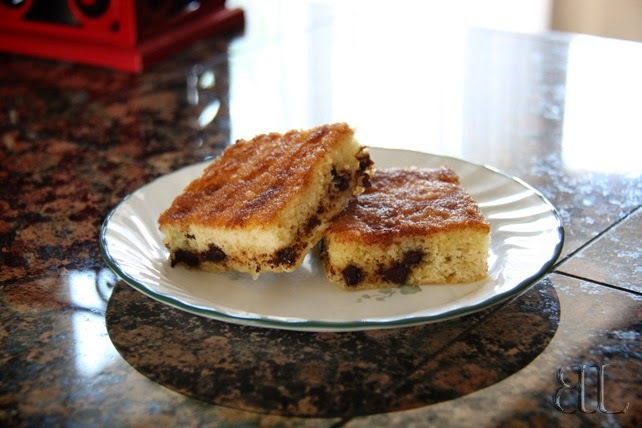 My big sister used to make it (with raisins) when I was little. I don’t remember when she decided to use chocolate chips instead, but it was a game-changer. When I moved out on my own—and out of state—I could not get the recipe to turn out right. It wanted to be flat and dry, so I experimented, and now it is wonderfully cake-y. And cinnamon-y. And, of course, chocolate-y. Preheat oven to 350°F. Grease and flour a 15x10x1-inch jelly roll pan. In a large bowl combine dry ingredients. Blend in remaining ingredients. Turn into prepared pan. Bake for 20 minutes or until golden brown. Drizzle with an additional ¼ cup melted margarine. Combine ½ cup sugar with 1 tsp. cinnamon. Sprinkle over cake. Bake 10 minutes more. Cut into squares and store in air-tight container.